Following a year in which the 2008 Beijing Olympics brought the international spotlight to China, global views of China have improved slightly. Moreover, among developing nations, many are beginning to view China as more of a partner to their country. But when it comes to whether China will eventually surpass the U.S. as the world’s superpower, majorities or pluralities in 16 of the 25 nations surveyed believe that this will never happen. Opinion of Russia is largely negative – in only three of 24 publics do majorities express a favorable opinion of Russia. On the other hand, the United Nations and the European Union receive high ratings. Notably, attitudes toward the U.N. are now more favorable in the U.S. With improvements in the image of the U.S., a greater percentage of the British public now has a favorable opinion of the U.S. than of the EU. However, Canadians rate the EU as favorably as they do the U.S. 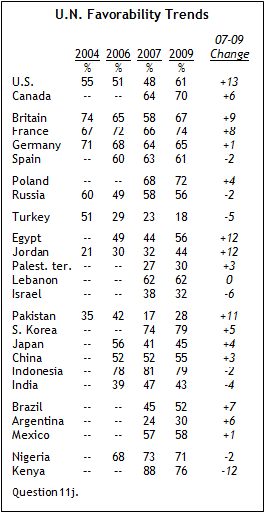 Majorities in 10 of 24 nations give China a favorable rating. China’s popularity has increased somewhat since last year in 10 of the 20 countries where trends are available, while decreasing in only three countries and remaining stable in seven countries. American public opinion regarding China has grown more positive since last year. Today, half of Americans rate China favorably, compared with roughly four-in-ten in previous years, (39% in 2008; 42% in 2007), respectively. Favorability ratings of China in the U.S. are now on par with results from the 2006 survey, when 52% felt favorably toward China. Despite a slight uptick in favorability ratings for China in three of the four Western European countries, views remain mostly negative. In France and Spain, positive opinions increased from roughly three-in-ten in 2008 (28% in France, 31% in Spain) to about four-in-ten this year (41% in France, 40% in Spain). However, negative views still mostly predominate in both of these countries. Only in Britain do majorities think favorably of China (52%), up from 47% last year. Opinions remain decidedly negative in Germany, where only about one-in-three respondents (29%) say they have a positive opinion. In Asia, opinions about China vary widely. China remains extremely popular among Pakistanis, as currently more than eight-in-ten (84%) express a favorable view, up from 76% in 2008. A majority in Indonesia give China a favorable rating (59%). Consistent with results from previous years, positive views of China in India slightly outweigh negative views (46% in 2009, 2008 and 2007). On the other hand, views among South Koreans have grown more negative in the last few years – just four-in-ten express a positive view (41%) compared with 48% in 2008. While more in Japan offer a positive assessment of China in 2009 than in 2008 (26% vs. 14%), negative views remain widespread. 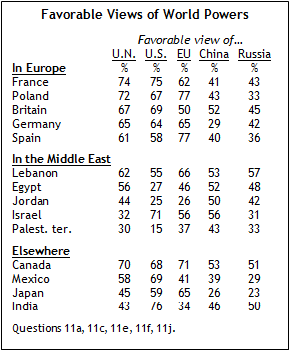 Slight majorities in three of the five Middle Eastern countries surveyed have a favorable view of China. Opinions in Jordan remain evenly split (50% favorable to China and 50% unfavorable). China is overwhelmingly popular in both of the African nations surveyed this year. Elsewhere, in Latin America opinions are mixed and many in the region are unable to offer an opinion. In nine of the 17 countries in which the question was posed, majorities or pluralities think of China as a partner to their country. In eight nations however, the balance of opinion is that China is neither a partner nor an enemy of their country, while no public in which the question was asked characterizes China as an enemy. The way in which people characterize their country’s relationship with China varies across regions. Kenyans, Nigerians and Pakistanis are the most likely to consider China a partner to their country. Views in Indonesia have shifted since 2008 – more now regard China as a partner than did so a year ago (52% vs. 41%). Pluralities or majorities in China’s fellow “BRIC” nations – Russia (51%), Brazil (49%), and India (43%) – currently say China is a partner of their country. For Brazil in particular, these findings mark a shift in opinion from last year when a plurality (49%) considered China neither a partner nor an enemy. China is rated as neither a partner nor an enemy by majorities in Israel (62%), Poland (60%), Lebanon (52%) and Japan (51%), along with almost half in Egypt (49%). However, China is rated as an enemy by significant minorities in Turkey (27%) and Mexico (24%). Will China Overtake the U.S.? Majorities or pluralities in 16 of the 25 countries surveyed believe that China will never replace the U.S. as the world’s leading superpower. But while there is no country in which a majority or plurality say that China has already replaced the U.S. as a superpower, many respondents in several countries, including China itself, believe that China will eventually replace the U.S. as the world’s leading power. Majorities in Japan (59%), Jordan (56%), Israel (56%), and Lebanon (54%) are confident that the U.S. will maintain its superpower status. Almost two-thirds of Egyptians (63%) say that China will never replace the U.S. as the sole superpower – up from 55% last year. A majority of Americans (57%) think that the U.S. will never lose its place to China as the superpower of the world. But one-third of Americans disagree and believe that the U.S. will either eventually be replaced by China as the world’s superpower (26%) or that it has already happened (7%). Western Europeans are more likely this year than last year to say that China will never replace the U.S. as the world’s leader. 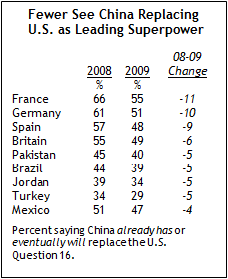 For instance, more than four-in-ten in Spain (44%) and France (43%) now say that the U.S. will retain its superpower position, an increase of nine points in both countries since 2008. But in all four countries, a majority or plurality believes that China has already replaced the U.S. or will eventually replace the U.S. as the top leader. A majority in China (59%) think that their country will eventually replace the U.S. as the leading superpower, and 8% believe that this has already occurred. On the other hand, one-in-five (20%) remain doubtful of the ability of China to surpass the U.S. as the world’s leader. Significant minorities in Mexico (17%), Argentina (16%) and India (15%) believe that China has already replaced the U.S. as the leading superpower. Russia’s increasing international prominence has not been well received by publics around the world. In fact, in most countries surveyed negative sentiments of Russia surpass positive sentiments. Overall, majorities or pluralities in 14 of 24 nations express an unfavorable view of Russia, while majorities in only three countries – Lebanon (57%), Canada (51%) and Nigeria (51%) – express a favorable view. Opinions are more mixed in the remaining countries, with many unable to offer an opinion either way. Russia is viewed in mostly negative terms in Western Europe. Majorities in France (56%) and Germany (51%) hold an unfavorable view of Russia, along with a plurality (44%) in Spain. Only in Britain do more have a favorable opinion of Russia than have an unfavorable opinion of Russia (45% vs. 33%). In the only other Eastern European country included in the survey – Poland – views of Russia remain decidedly negative (56% favorable vs. 33% unfavorable). 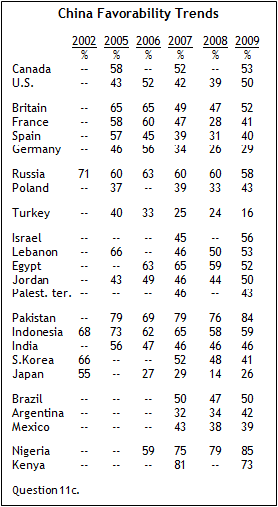 In no Asian country surveyed does a majority express a favorable view of Russia. However, half of South Koreans and Indians hold a positive opinion of Russia. Favorable views declined among the public of one of Russia’s closest allies – China. Today, fewer Chinese hold a positive opinion of Russia than did two years ago (46% in 2009, 54% in 2007). Most Japanese have a negative opinion of Russia (68%). Favorability ratings of Russia dropped in both of the African nations surveyed this year. 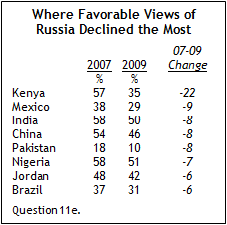 Among Kenyans, positive views of Russia declined by 22 percentage points from 57% in 2007 to 35% in 2009 – the largest drop of any public included in this survey. While a majority of Nigerians (51%) offer a positive rating of Russia, this marks a slight decrease from 58% in 2007. Finally, in Latin America many respondents are unable to offer an opinion and neither the favorable nor unfavorable position is given by a majority in any of the three countries surveyed. Nearly half in Argentina (48%), more than one-third (36%) in Mexico, and about a quarter in Brazil (24%) did not offer an opinion when asked about Russia. Majorities or pluralities in 18 of the 25 countries surveyed have a favorable view of the European Union. And while the balance of opinion remains mostly positive – three countries are the exception. Large majorities in Jordan (72%), Turkey (59%) and the Palestinian territories (57%), along with 50% in Egypt express a negative view of the EU. A majority of Americans (56%) have a favorable opinion of the EU, while only 23% say they have a negative opinion. This represents an improvement in favorable judgments from two years ago, when fewer than half (47%) felt favorably toward the EU. Support for the EU is widespread among the five EU member countries included in the survey. Upwards of three-quarters in Spain (77%) and Poland (77%) offer a favorable opinion of the EU. Almost two-thirds in Germany (65%) and France (62%) express a positive attitude towards the EU. Only in Britain is the balance of opinion less than decisive. Half of respondents in Britain say they have a favorable opinion of the EU, compared with 39% who have an unfavorable opinion. Moreover, the 2009 findings suggest that the ongoing dispute between the EU and Russia has had little influence on Russian public opinion of the institution. Almost seven-in-ten (69%) in Russia say they have a favorable opinion of the EU, compared with 62% in 2007. In Asia, opinions among South Koreans and Japanese remain largely positive, with majorities in both countries expressing favorable views of the EU (South Korea 74%, Japan 65%). Favorable views of the EU in Kenya and Nigeria have declined, but the balance of opinion in both countries remains largely positive. Among Kenyans, positive views of the EU dropped 20 percentage points from 82% in 2007 to 62% in 2009. Opinions of the EU also declined in Nigeria – though not as steeply – from 71% in 2007 to 61% in 2009. The ongoing frustration in Turkey over its on-again, off-again membership negotiations with the European Union are reflected in these data. Today, only about one-in-five in Turkey (22%) have a favorable view of the EU, reflecting a decline since 2004 (58% favorable). Almost half of Pakistanis (46%) and roughly one-third of Argentines (38%) and Mexicans (35%) are unable to provide an opinion of the EU. In all three of these countries neither the favorable nor unfavorable position is given by a majority of people. Majorities or pluralities in 19 of the 25 countries surveyed have a favorable view of the United Nations. Moreover, ratings of the U.N. have grown more positive since 2007 in 12 of the 25 countries. Currently, roughly six-in-ten (61%) in the U.S. hold a favorable view of the U.N. This represents a 13-point increase since 2007 in favorable ratings – the largest increase of any public included in the survey. This is the highest favorability rating given to the U.N. since the question was first asked by the Global Attitudes Project in 2004. Positive opinions of the U.N. also increased in Canada from 64% in 2007 to 70% in 2009. Favorable opinions of the U.N. throughout the Western and Eastern European countries surveyed remain largely positive. In France, 74% feel favorably toward the U.N., up eight points from 66% in 2007. Similarly, the British are feeling more positive towards the U.N. today (67%) than two years ago (58%). Majorities in Germany (65%) and Spain (61%) express positive views, largely unchanged since 2007 and most Poles (72%) and Russians (56%) share a similar sentiment towards the U.N. Favorable views of the U.N. are widespread among the two African publics surveyed, though positive views have declined in Kenya. In 2007, favorable opinions among Kenyans were nearly universal (88%), but just two years later slightly fewer (76%) express the same opinion. Among Nigerians, a strong majority (71%) gives a favorable rating to the U.N. However, opinions of the U.N. are sharply negative among three of the publics in the Middle East. Almost six-in-ten (57%) in Jordan say they have an unfavorable view of the U.N. Israelis and Palestinians find rare common ground in their dislike of the U.N. with roughly two-thirds of both publics saying they have an unfavorable opinion (67% in the Palestinian territories, 65% in Israel). Lebanese and Egyptian respondents stand apart from those in neighboring Middle Eastern nations surveyed, with majorities in both countries expressing a favorable opinion of the U.N. (62% in Lebanon, 56% in Egypt). In Egypt, this marks an increase of 12 percentage points since 2007. Opinions of the U.N. in Turkey have steadily declined since 2004. A majority (51%) in Turkey expressed a favorable opinion toward the U.N. in 2004; many fewer this year (18%) feel the same way. In South Korea and Indonesia the U.N. is seen in a favorable light (79% favorable in both countries). But elsewhere in Asia, opinions of the U.N. are not as glowing. Fewer than half in Japan (45%) and India (43%) hold a positive opinion of the U.N. Among Pakistanis, only about three-in-ten (28%) do so, but about four-in-ten (42%) are unable to offer an opinion. In Latin America, majorities of Brazilians (52%) and Mexicans (58%) express a favorable view of the U.N. But in Argentina a plurality (45%) of respondents are unable to give a favorable or an unfavorable opinion of the U.N.